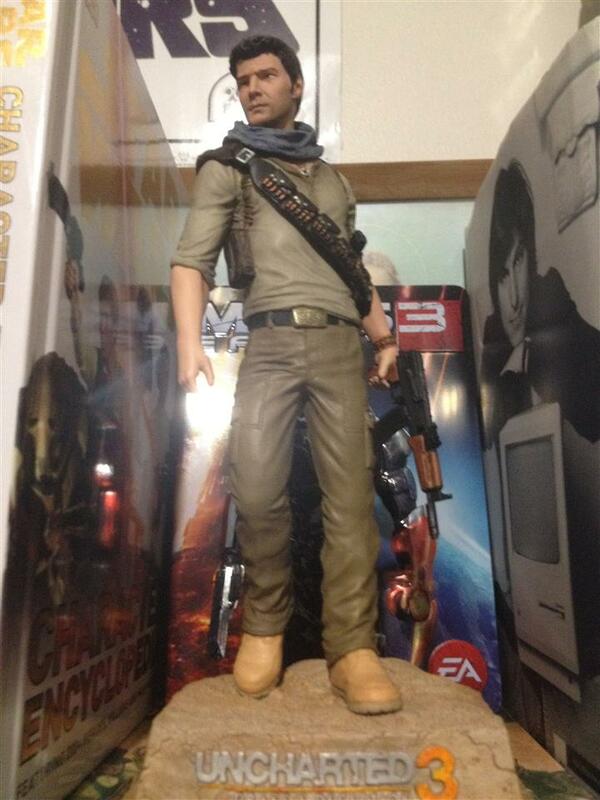 Sideshow Collectibles Nathan Drake collected in Figure Collection by Tayler Rowe - Collected It! Although this was a figure that came with the collector's edition of Uncharted 3, the amount of detail Sideshow Collectibles have put into this is clearly shown. Being an obsessed fan of the franchise, the moment they announced a figure of Nathan Drake, I was all over it like a dog in heat. The figures base is awesome having the huge logo of Uncharted 3 right under Nathan's feet, and the cool little details such as his necklace and belt buckle a very noticeable. But unfortunately the face is a little off, Don't get me wrong there are slight hints of Nathan but from certain angles it does look a little wonky. As I said before, the base sets this figure apart from the rest and puts Nathan in the iconic stature. No wonder Sony announced him as the Playstation's official mascot.